Over the decades, we’ve seen scores of movies that attempt to emulate the works of Alfred Hitchcock; heck, those could constitute their own subgenre. I’m not sure how many flicks have been overtly “Spielberg-esque” across the last few decades, but if one wants to compile such a list, 2011’s Super 8 deserves a place at the top. And it should probably get bonus points because it boasts Steven Spielberg himself as executive producer! JJ Abrams’ homage to Senor Spielbergo, Super 8 takes us to Ohio circa early 1979, as we visit the wake for the mother of adolescent Joe (Joel Courtney). She died in a terrible industrial accident, so that leaves Joe alone with his father Jackson (Kyle Chandler), a local law enforcement officer. From there we leap ahead four months to the start of summer vacation. Joe plans to participate in the Super 8 movie directed by pal Charles (Riley Griffiths) along with the participation of fellow friends Cary (Ryan Lee), Preston (Zach Mills), and Martin (Gabriel Basso). Also involved in the shoot: Alice (Elle Fanning), a cute girl whose presence brings a certain adolescent sexual tension to the gang. During a night shoot at a station, a train roars by and derails after a pick-up truck gets in its path. It turns out high school biology teacher Dr. Thomas Woodward (Glynn Turman) drove the vehicle and intentionally forced it off the tracks. Why? To bring out the truth about a secret government operation. The kids become involved because the military learns that they captured the events on film. 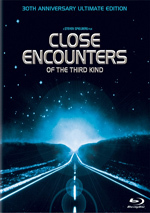 We follow all the twists and turns as we see what happens with Joe and his friends – and an escaped alien creature. It’d be a stretch to say that Super 8 emulates my life. I recall no massive train crashes or alien visitations; I did break my collarbone and our house caught fire over the span of eight days in July 1979, but those events probably aren’t as “movie-worthy” as those captured here. Still, I should feel a link to the film – and to the perspective of Abrams, as we’re both close in age and both apparently grew up with a deep affection for the works of Steven Spielberg. Unfortunately, Abrams does little more than wear these influences on his sleeve with Super 8, as it usually feels like little more than a mix of Jaws, Close Encounters of the Third Kind, ET the Extra-Terrestrial and The Goonies. I understand that Abrams wanted to make an homage to the Spielberg classics of his youth, but couldn’t he have created something less derivative? Apparently not, though he also forgot to develop a movie as fun/creative/interesting as those Spielberg works. As much as I wanted to love Super 8, I thought it was a bore. I didn't care about any of its various plot threads, and I thought the whole thing was such a blatant amalgam of parts from other films that it was tough to get involved in it. Abrams wore his influences so obviously on his sleeve that all I saw was those references. The movie's main problem remains that it's little more than a conglomeration of scenes/notions from better movies without much to make them fit together. The piece often feels disjointed, as though Abrams came up with its allusions but couldn’t be bothered to connect them in a logical manner. This gives the flick a disconnected feel as it flits from one genre to another without much coherence. 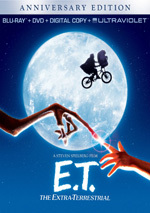 ET acts as the biggest inspiration, though – and the one that creates the most problems, as Abrams can’t figure out what tone to use. Abrams shows scenes of the scientists testing/torturing the alien to gain sympathy for the character, but in truth, it's no more a victim than the shark in Jaws. The shark's not evil - he just does what sharks do. The alien also doesn't appear to be sinister, but it's still chowing on people, so it’s not exactly a sympathetic character. The alien/Joe connection feels like Abrams stole it from ET but the movie doesn't earn the same emotional payoff. We don't know the alien and we don't really care about the alien. Sure, the movie gives us some indications that he's just some poor schlub who got stuck here, but we still don't have an ET-style connection with him. I think Abrams erred when he made the alien such an overt threat. If Abrams wants us to care about him, it's best to not treat him like the title character from Alien, out there cocooning folks and chomping on them. It becomes hard to think "poor space dude!" when you see him bite off some innocent local's head. I think Abrams wants us to subconsciously - consciously? - view this flick's alien ala ET, but the film does nothing to earn that affection; just because Abrams tells us to feel bad for the alien doesn’t mean we will or should. Further problems impact the underdrawn characters. Other than Joe, virtually all of them act as one-dimensional plot motivators, and even our lead kid comes with developmental problems. In particular, the movie’s view of Joe’s emotional status makes no sense. Bizarrely, the characters act like Joe must “move on” and get past his mother’s demise, like it's some huge impediment to his ongoing health. However, the kid actually seems pretty well-adjusted. It's only been four months since she died, and he's doing nicely. Sure, he treasures a locket he got from his mom, and he should. That's healthy and it's borderline insulting that the movie makes him sacrifice this cherished connection to his mother to help save some space monkey he barely knows, especially since the movie implies the stupid kid needs to stop obsessing over his dead mother and just get over it. Seriously? A kid loses his mother in a disturbing accident, seems to be coping with it well, and yet is viewed as some social leper because he misses her and wants to maintain a physical connection to her? And we’re supposed to encourage him to sacrifice that totem to rescue a creature that eats people? Am I the only one who finds issues with this narrative? I could go on and on with the movie’s problems. Why does Abrams go out of his way to make a movie that fits the early 80s vibe – but then features the teal/orange palette that makes it firmly a product of the modern era? How does Dr. Woodward survive a head-on crash from a speeding train? Why can’t Abrams buy cameras that lack intrusive lens flares every other second? Even with all these criticisms, I can’t say I hate Super 8. It still has some good action scenes – the train crash is awesome – and it manages to keep us reasonably interested across its 111 minutes. However, its flaws really do outweigh the handful of positives. Abrams made a completely derivative movie that goes nowhere. It’s little more than a big collection of movie references packed into one loose plot. Super 8 appears in an aspect ratio of approximately 2.35:1 on this Blu-ray Disc. Super 8 presented a terrific picture. Sharpness seemed strong. A few shots occasionally looked a little fuzzy, but otherwise I never noticed any signs of softness. Instead, the movie looked nicely crisp and detailed. Jagged edges and moiré effects created no concerns, and no edge enhancement seemed to be evident. I noticed no signs of print flaws, as the image looked clean. Super 8 demonstrated Hollywood’s “orange and teal” trend, though more toward the teal than the orange. Though these weren’t the only hues that appeared, they did dominate. Only rarely did the film offer tones that seemed moderately natural. However, the disc replicated them accurately, as its hues represented the flick’s design well. As for the dark elements, they were deep and dense. I thought blacks seemed nicely replicated and presented clear, taut textures. Low-light shots came across appropriately. They looked very well-defined and delineated and made the movie quite attractive. Super 8 gave us a fine transfer. Similar praise greeted the Dolby TrueHD 7.1 soundtrack of Super 8. As I expect from an action picture, the soundfield offered a lot of activity throughout the film. Vehicles, explosions and other connected elements zipped all around the room in lively but natural manner. The elements formed a fine sense of setting and immersed us in the action; the train crash was a standout, but other scenes worked well, too. Music showed good stereo presence as well, and even used the surrounds at times. The soundfield seemed broad and engaging. The film comes with a good collection of bonus features. First comes an audio commentary from writer/director JJ Abrams, producer Bryan Burk and director of photography Larry Fong. All three sit together for this running, screen-specific look at story/character/thematic topics, inspirations and influences, cast and performances, editing and photography, music, visual effects, sets and locations, period details, and a few other areas. While the track covers a good array of subjects, it remains spotty. That’s because it tends to meander, as the guys occasionally seem more interested in entertaining each other than delivering useful information. We do learn a fair amount about the production, but this still feels like a patchy chat. Eight Featurettes occupy a total of one hour, 37 minutes and 15 seconds. We find “The Dream Behind Super 8” (16:23), “The Search for New Faces” (17:42), “Meet Joel Courtney” (14:29), “Rediscovering Steel Town” (18:20), “The Visitor Lives” (12:17), “Scoring Super 8” (5:24), “Do You Believe in Magic?” (4:25) and “The 8mm Revolution” (8:15). Across these, we hear from Abrams, Fong, Burk, producer Steven Spielberg, casting directors Alyssa Weisberg and April Webster, production designer Martin Whist, executive producer Guy Riedel, production assistant Josh Foglio, Arcelormittal general manager Brian James, Arcelormittal employee Greg Blankenship, Weirton WV resident Steve Amendola, Weirton Area Museum and Cultural Center executive director Dennis Jones, visual effects supervisor Dennis Muren, creature designer Neville Page, visual effects supervisors Kim Libreri and Russell Earl, animation supervisor Paul Kavanagh, composer Michael Giacchino, Flicker founder/8mm expert Norwood Cheek, Cinelicious EP/principal Paul Korver, and actors Ryan Lee, Riley Griffiths, Elle Fanning, Zach Mills, Gabriel Basso, Joel Courtney, Kyle Chandler, Ron Eldard, and Noah Emmerich. The programs cover autobiographical elements and the film’s development, influences, story/character areas, cast and performances, sets and locations, period details and production design, creature design and effects, music, and the history of 8mm filmmaking. The quality of the different featurettes varies, but most are good. We learn a fair amount about the flick’s creation in these enjoyable and informative clips. An “interactive exploration” called Deconstructing the Train Crash shows up next. It lets us follow the scene from pre-production to production to post-production via a mix of text, stills and video clips. The information adds a good exploration of the processes used for the movie’s big action sequence, but the interface proves to be a nuisance, as it can be slow to progress through the pieces. Actually, you can use chapter skip to avoid constant returns to the main menu, but it’s still awkward. 14 Deleted Scenes fill a total of 12 minutes, 47 seconds. With so little time per segment, none of them have the chance to add much. The majority pad out relationships among characters to a minor degree; I don’t see anything important left on the cutting room floor. 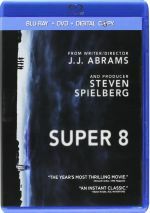 A second disc offers a DVD copy of Super 8. This is a bare-bones affair with none of the Blu-ray’s extras. An homage to the classic Spielberg movies of the Seventies and Eighties, Super 8 displays its influences without any sense of its own vision. We get little more than a collection of references to other flicks without much to bring them together in a coherent, involving narrative. The Blu-ray delivers terrific picture and audio along with a fairly nice collection of extras. As much as I want to like Super 8, its derivative nature and lack of narrative clarity make it subpar.